← How To Make Money by Selling Your Clothes! 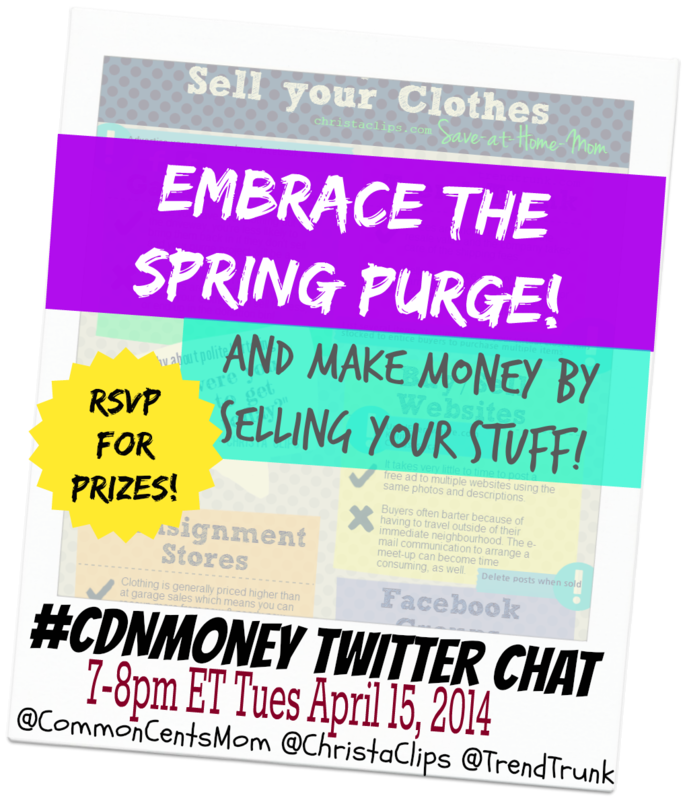 #CDNmoney Twitter Chat Tuesday April 15, 2014: Embrace The Spring Purge and Sell your Stuff! Time to clean out your closets, drawers, and garage? This week’s #CDNmoney chat will inspire you to Embrace the Spring Purge as we’ll share tips & tricks for how to make some money by selling your stuff! Join co-hosts Common Cents Mom and Christa Clips with Special Guests Trend Trunk for a lively hour of ideas & inspiration! Hollie has already tackled one of her closets and shares her strategy in her blog post The Spring Purge: Tips for Closet Cleaning. Christa follows up with a blog post about How to Make Money by Selling your Clothes after you’ve completed the purge! Winning back some space and earning some money along the way = WIN WIN! To participate in the #CDNmoney chat and to be entered to WIN one of the five prizes we have this week …. TrendTrunk has graciously donated 5 TrendTrunk gift cards to spend on their website! Be sure to RSVP below and answer the twitter chat questions to be eligible to win one of the prizes. If you’ve never joined a twitter chat before, here’s Hollie’s blog post about How to Participate in a Twitter Chat or Twitter Party to help you get started! Hope to see you at #CDNmoney chat! Posted on April 15, 2014, in #cdnmoney Twitter Chat, Christa Clips, Common Cents Mom and tagged #cdnmoney Twitter Chat, Christa Clips, CommonCentsMom, how to make money by selling your used items, spring cleaning, Trend Trunk. Bookmark the permalink. 1 Comment.